The recipe for these healthy chickpea blondies, is great for everyone who loves desserts, but prefers healthy alternatives. It is also ideal for everyone who cannot force himself into eating legumes. Chickpea is very healthy and, along with oats, replaces flour in this simple and sweet recipe. Check out what a tasty delicacies can be baked using chickpea. This healthy chickpea dessert is without flour, sugar, or eggs. It is sweetened with honey and is very easy to prepare. A substantial part of fat in the recipe was replaced with applesauce, making this dessert more diet. Thanks to oats and chickpea, it is richer in fiber, vitamins and minerals and has a finely nutty flavor. Vanilla extract will take care of its delicious taste with a soft, vanilla touch. You can add chocolate chips, dried fruit or nuts to your taste. If you replace honey with another sweetener in the batter, you can easily prepare it in vegan version. 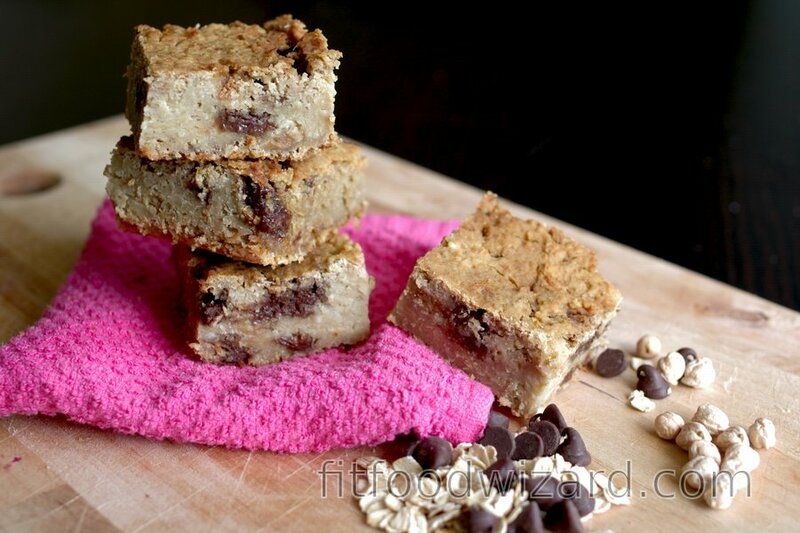 I call these healthy chickpea blondies the superb, because I ate almost all of them for wait. So I hope you will like them the same way I do. A little note at the end: This dessert tastes the best on the next day, after sitting in the refrigerator. Grind or blend oats until fine. Mix together all ingredients, except chocolate chips/dried fruit/nuts, in a bowl. Divide the mixture into halves and blend it part by part in a blender (don’t use a big heavy-duty blender because the mixture is too dry, instead use a small chopping bowl that should be part of your hand blender set. If you don’t have it, try to blend it with a hand blender). When the whole mixture is blended and combined until smooth, stir in chocolate chips (or dried fruit and nuts as well). Pour the batter into a small cake pan. Choose a size according to desired cake height (e.g. 8x8inch). Bake the cake at 180 degrees Celsius (350 °F) for 35 to 40 minutes checking occasionally so that it doesn’t burn. When the cake is baked, remove it from the oven, let cool, and place into the refrigerator for at least 5 hours. It’s very delicious right after baking, but it’s even better the next day.